The future of virtual reality in the customer experience, the effects of fiction coming to life on the big screen, and how the future is (or isn’t) all about VR. New ways that companies are using virtual reality in the customer experience. A look at what the Ernest Cline’s novel, Ready Player One, can tell us about the future of CX. Joey and Dan square off over how big VR will actually become. A look at the importance of customer loyalty programs. Dan: Join us as we discuss how virtual reality is starting to impact dozens of industries, the effects of fiction coming to life on the big screen, and how the future is or isn't all about VR. Joey: Virtual reality, big screen reality, and your reality, oh my. There are so many great customer experience articles to read, but who has the time? We summarize them and offer clear takeaways you can implement starting tomorrow. Enjoy this segment of CXPRESS, where we read the articles so you don't need to. Today's CXPRESS article comes to us from Mycustomer.com, and is titled '6 Examples of Companies Using Virtual Reality To Improve Customer Experience'. It was written by a freelance writer and blogger, Dianna Labrien and provides an overview of several companies that are using VR technology or virtual reality technology as part of their design and customer experience process. Dan: One example the article noted is from the automobile industry. Brands such as Peugeot, BMW, Jaguar, and Ford are using VR in the development of prototypes for new car designs. This allows designers from remote locations to collaborate. It limits expenses of having to meet in person, and it also eliminates the expense of developing physical prototypes, which are then discarded. Joey: Another example from the article that I personally really enjoyed was the uses of VR in the legal field. As a recovering attorney, I found this one pretty interesting, and the main way or the most interesting way that VR is being used in the legal field right now is to recreate scenes for the jury. Now, when I was a practicing lawyer, we used to build little models out of Legos or whatever it may be to lay out the scene. We'd occasionally have drawings or sketches, that type of thing, but now, you can actually walk the jury through a virtual accident scene or a crime scene so that they can experience in virtual reality what actually happened the day that the incident occurred. Dan: Mental note, tell Joey that we should have a whole separate segment about him using Legos in the courtroom, because I really want to hear more about that. Joey: Hey, man. Let me tell you, early on in the game, as this quick segue here, my dad was a criminal defense lawyer, and occasionally would have me build the dioramas of different scenes out of Legos that he would then take into court, so I started doing that when I was a kid. What can I say, dad was ages ahead of his time. Dan: That is awesome. The travel industry is also using a VR to help respective vacationers 'Travel' to destinations through virtual reality and experience hotel accommodations, activities, museums, et cetera right from their homes. Not sure why they then have to travel, but prior to making their decision on vacations, and this type of VR offering is starting to pop up with early adopters like Marriott Hotels, Thomas Cook, and Lufthansa. Joey: I think that was one that actually had made a little bit of sense from a point of view that a lot of Americans really don't do a lot of vacationing, and they kind of store up, and my thought was if somebody was kind of storing up their vacation time and their money to go on a nice vacation, if they got the chance to experience it in advance, that might help with some of the fears they had about making that investment. Joey: Later in this episode. Who knows? Dan: Or a [shot 00:04:07] away. Joey: Or we will see. The article concludes by giving some examples from education where they're using VR to test students, medical care, creating environments for patients to test their coping skills for example, and retail where you get the opportunity to try on clothes without needing to even go into the store, something that I know you in particular would love, Dan, but you'll need to read the article to learn more. The key takeaways from the article however are number one, no business is too small for augmented or virtual reality customer experiences. You really should be thinking about this. If not, incorporating it into your business in 2018, at least, be thinking about the impact that augmented reality or virtual reality might have on your overall operations. Number two, as the tools continue to improve, you need to move from considering VR to actually playing around with it, and we'll talk more about that in some of the segments that we have coming up in this episode, but getting familiar with what's going on in the world of virtual reality is something that I think would benefit any customer experience professional. Finally, number three, today's consumer is looking for experiences rather than actually seeing a product online, and then trying to determine if it would actually be valuable. The experience gives you the chance to seal the deal, whether that experience is in real life or in virtual reality. We spend hours and hours nose deep in books. We believe that everything you read influences the experiences you create, so we're happy to answer our favorite question. What are you reading? Dan, I know you're a busy guy, but I also know that not too long ago, I made a little recommendation about a book that you might want to check out, called 'Ready Player One' by Ernest Cline. Have you had a chance to read that? Dan: Actually, I just finished it, and I was so excited for the movie coming out. I knew I needed to finish the book before I allow myself to go see the movie, and I love that recommendation, and I really appreciated you making me aware of it, and it was a totally fun read and it was definitely a nice break from all the business books that I've been reading recently. Joey: I love it. I love it. Yeah. I'm a big fan of reading business books because I think there's a lot to learn, but I think every person in business need ... It's my personal belief that you should sprinkle in at least one fiction book for every three business books. I personally tried to do more of a one to one ratio, but at least one fiction for every three. Since you read it, I'd be curious because we haven't ... Folks playing along at home, Dan and I have not had the chance to talk about this. I had recommended the book, but I didn't know if he'd had a chance to read it yet. What did you think about the book? What particular parts did you like or how did this fit because I know you're not as much of a fiction reader as you are like a non-fiction business book reader? What were some of your favorite parts? Dan: I do like fiction books, and I actually agree with you on the one to one ratio. What I don't tend to like is science fiction. It's funny because the more I say that, the more I can over time cite examples of science fiction books or science fictionesque books, fantasy books, whatever that I actually did love. For example, I love the 'Harry Potter' series, and I would put that clearly in the section of fantasy and magic and all that sort of thing, and so I can tolerate it, but it's never been one of my favorite genres. This, I thought was awesome, and the reason why it brought me in was because I am a child of '80s. Dan: I love '80s music. I've always loved '80s music. Back in the day, I had when I got my first, I think it was a 6-CD changer. I burned six CDs worth of '80s hits, and I eventually went on to burn I think 13 CDs, which are now of course all in iTunes and what have you, but I love '80s music. I grew up with an Atari 2600, and in fact, fun fact, I went from an Atari 2600 to a Wii. I had nothing in between. Dan: Part of that is I've actually ... I think you know this about me. I'm more of a Pinball guy. I love Pinball, but Pinball is a throwback to the era of the '80s as well, and so I just thought that for the '80s references alone in this book, of which there are many, many, many music, movies, video games, et cetera, I thought it was so much fun, and I really had no problem with the science fiction part of it, the suspension of disbelief that this is really a different world and a made-up world, but I though it was great. It was a page-turner, and whenever it was getting too late at night and I had to put the book down, it was definitely one of those things where I wish I could stay up all night. Joey: I love it. I'm so glad you enjoyed it. Yeah, I definitely felt the same way about this. I actually read this book originally back in 2011 when it came out. Then, with the movie, not long after it came out, the movie got picked up, and Steven Spielberg was going to direct, and I thought that was great news. Then, when I was at South by Southwest a few weeks ago, they had a huge display for 'Ready Player One', and so I was already excited about the movie, and it's one of my wife's ... My wife is a veracious reader, and it's one of her favorite fiction books, and so this has been on our calendar to go see this movie, and we actually went and saw this movie just a few days ago, two days ago actually, and loved it. What I will say for anybody listening along who's read the book and is planning to go see the movie, they are two very different story lines. The characters are the same. The general plot, which isn't ruining anything if you haven't seen the movie or the books, it's about this contest where these players in this virtual reality world, these avatars need to complete various quest or task to win these three keys, and the winner of the keys get a huge prize, which you'll learn about in the movie. I won't share it here, but I will tell you that the quest that they have to go on in the book are very, very different than the quest they need to go on in the movie, and a lot of people were upset about that, but I think the thing that I loved about it is almost as if Ernest Cline, who's the writer of the book and who was also the screen writer and the advisor on the movie, it's almost like he gave us two stories, which I actually thought was pretty cool. It's kind of you get the benefit of both worlds. One of the reasons I wanted to ask you about this is that the kind of the core theme of the story is that there is this virtual reality world called the 'Oasis', where basically, the citizens of the world living on planet earth has become such a not fun experience that everybody for lack of a better way of putting it, jacks in to the virtual world, the Oasis, and that's where they live. They have jobs. They have task. They go to school there. They go on quest. They do all these things to distract them from the world that they're in. There's this great quote from the book, which I really liked, where the protagonist, Wade, who's also known in the virtual world as Parzival says, "I don't know. Maybe your experience differed from mine." "For me, growing up as a human being on the planet earth in the 21st century was a real kick in the teeth, existentially speaking. The worst thing about being a kid was that no one told me the truth about my situation. In fact, they did the exact opposite, and of course, I believed them because I was just a kid and I didn't know any better." 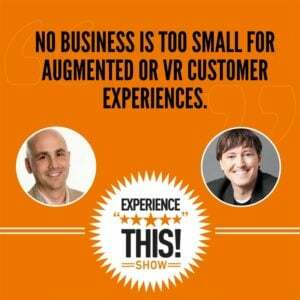 They talk about this situation where living in the real world isn't nearly as exciting as living in the virtual world, which I thought offered some interesting things for us to consider as customer experience professionals and people that work in the space of customer experience, and thinking about how virtual reality might impact our businesses. What do we need to be thinking of? What do we need to be considering going beyond that just, "Oh, can you feel the product in a virtual setting and use it and get the experience? ", versus stepping into almost an immersive experience of living in a virtual world? Dan: Yeah. I mean, we don't even talk about these sort of political commentary that is there, talking about an earth that is essentially uninhabitable, and therefore, people want to go live 'In this Oasis' reality or virtual reality, but I think that you hit on a really interesting point, which is that this virtual reality today in 2018 in the real world is usually a temporary thing. It's you put on some goggles, or you go and participate in something that takes a couple of minutes, and you have this alternate experience, whereas this book is really exploring the idea of, "What if that experience became your life, and that you spent 98% of your time in that world, and only a tiny bit of time in the 'Real World'?" I thought that was pretty interesting. Again, there's some definite commentary behind that in terms of a how or why we would even get to that point, which is quite frightening, but I thought that this was interesting at so many different levels. Dan: I always appreciate whether it's sports or hobbies or what have you. I always appreciate somebody who is really into something, and just really a fan of something such that they know everything about it, they spend a lot of time learning, even in the baseball world, and you know I'm a big baseball fan. People who are die hard fans of the team that I hate, I still have respect for because they're die hard fans, right? They've spent the time, they've grown up, they've paid, they've put in the time, et cetera, and I think that this main character, Wade for me was kind of like that, but he's not a guy that everybody will relate to. He's a real introvert. He has basically mastered every video game that there is, and he spends all his time watching television and movies, and memorizing words and lyrics, and conversations and et cetera from TV shows, whatever. He's like a nerd's nerd, but he is likable in the sense that he really gets full into. He doesn't do anything half-assed, like he gets into it and really goes for broke on everything, and then meets these friends who are very similar. I just thought it was not the kind of book I would have expected me to like because the characters were not me, but I always ... I've had this conversation with a lot of people before that the reason why we read books like this or go to movies is to experience a different reality, right? If you went as a recovering attorney, and you went and saw a great legal thriller in the movie theater, and it was what a real courtroom was like and a real case, it'd be really boring, so you go. Dan: You don't want it to be realistic because if it were realistic, it would be boring, and I think that's what was kind of cool for me here, was that this was not a reality that I personally could identify with, but I really appreciated it and loved it while I was there. Joey: I couldn't agree more, and I loved the book as well. I really enjoyed the movie too, and I think at the risk of having any of our listeners say, "Guys, what does this have to do with business? ", I think it has a couple of things to do with business, and so here are some key takeaways. Number one, it's really useful to read fiction to expand your understandng of experiences. Like we all work in the customer experience space, and I think all too often, we get used to creating the same type of experiences that are kind of the norm or being acceptable within our industry or within the business world, or even in our society, and I think reading fiction pushes us beyond those limits a little bit. Number two, I think reading science fiction in particular exposes us to what could be coming down the road and what's there in the future. Everything that is presented in "Ready Player One' is a technology that exist today. Everything. There's no technology that they talk about in either the movie or the book that doesn't exist in some format today. Now, it may not be as advanced as the world that they present in the book and in the story, but the building blocks for creating that are already there, and so I think there's an opportunity to pay attention to that. Number three, I will say that building off what you said, Dan, we may not personally relate to the video game playing, '80s music loving, Wade Watts or Parzival character in the book, but we all I think in our businesses want to have raving fans, and I think there's some takeaways we can glean from looking at what a true raving fan, or as you said, a nerd's nerd looks like, and try to create the space within our own organization or our own operations to reward that behavior or acknowledge those type of raving fans. The last thing I'll say is if you like 'Ready Player One', there are two other books that I would recommend. One is called 'Pattern Recognition', which is by the science fiction author, William Gibson, which is all about a protagonist character who has a visceral reaction when she sees a logo that allows her to know whether a brand is going to be successful or not, so as somebody who worked in branding, I just thought this was particular interesting. Another writer who was fantastic in the area of science fiction who's written a number of great books is Daniel Suarez, and his newest book is called 'Change Agent', which is all about gene modification and the CRISPR technology. Now again, these are outside the bounds of the typical business operating today, and I imagine the typical listener, but check out these books because they will open up your minds to what the possibilities could be in the future. We usually see eye to eye, except when we don't. See if you find yourself siding with Dan or Joey as we debate a hot topic on this segment of Agree To Disagree. Dan, I had a unique experience a few weeks ago that I wanted to tell you about. I had the opportunity to go down to South by Southwest, and while I was there, I got to see a pretty impressive setup for the movie 'Ready Player One', which we just talked about in the previous segment. What they had done is they had built kind of this Ready Player One experience, so they had a bar with the DeLorean in it, and with custom movie posters, and an Iron Giant if you remember that movie from the late '90s, the animated movie by the same name where they had dancing, and they had merch, and then they had these stacks of trailers. Now, if you're familiar with the book 'Ready Player One', you know that they have folks live in these scaffolding where they've placed mobile homes in scaffolding, stacked on top of each other, and they had a similar setup where you could go into one of these mobile home trailers and play a virtual reality game, which was really cool. You were kind of on a foreign planet in a space age type setup shooting bad guys. They had a two-minute limit, but I'll be candid, I got sucked in and they kept letting me play, and so I played for about six minutes straight in this virtual reality world, and it was pretty darn incredible. Joey: Yeah. You almost sound enthusiastic when you say it. Dan: No. I mean, it does sound like a fun experience, I know. I have never been to South by Southwest, but I've always wanted to go, and they do things up pretty well down there as I hear, and so this definitely sounds like it is ... You have my attention, let's put it that way. Joey: I'm telling you, I think virtual reality is going to be a lot bigger than people think. After having this experience, I also saw this amazing VR art installation by a group called 'Marshmallow Laser Feast', which they should get prizes even just for their name, called the 'Colossal Wave', where you were interacting in this virtual world, and I'll be honest, I felt like I was there. I got sucked in. Dan: All right. I've done a little bit of this virtual reality stuff. To me, I don't think it's going to be that big of a deal. I think it's going to be fun for people like gamers, like the folks in 'Ready Player One'. I think there's definitely applications in the medical field and others where it can be useful, but I don't see it becoming mainstream anytime soon. Dan: 25 episodes later or so, it's still here. Joey: It's still here, but I still hold strong that Twitter is not in its current incarnation going to exist much longer, however, I think we found ourselves to another topic that we might have to agree to disagree on, Dan. Dan: I say game on. See what I did there? Joey: All right. Let's do it. Enter the octagon. All right. Here's why I think VR is going to be even bigger than people think, all right? We are just getting started. This is like the dial-up age of the internet as it relates to an analogy to virtual reality, right? Yes, virtual reality is mostly for gamers right now, but it is already impressive as to how it can become totally immersive, and the effect that it has on your mind. I mean, I know in one of these, when I was doing the Colossal Wave in part of the simulation, I was standing, holding on to a pole up on top of like a rocky cliff, and the cliff fell away underneath me, and I actually found myself holding on tighter because it seemed like I might fall off the cliff, and this was in like the rough edges. I think there's a lot of potential here. Dan: All right. That's because you were in a virtual reality simulation that again was temporary, and I agree that the brain can be fooled, but not for an extended period of time. I don't see anybody using this thing for more than a few minuets for example. I don't see ... The world that was presented in the book, 'Ready Player One' is people spending their entire lives in virtual reality, and that is just something I don't see happening. I again totally buy that you can go and have an interesting out-of-body experience for a few minutes, but that is just a simulation, and it is not to me, there's just not enough uses for it to make it the next internet. Joey: See, I think there are. I think we're just scraping the beginning. In the beginning of the internet, when they just had message boards, people are like, "Oh, who wants to go on and post a message on a bulletin board that four other people in the world are going to read? ", and now, billions of people go on Facebook every day to post on a message board, their wall, something that they hope that many other people will read. I think we're at the beginning stages. The projections are that three years from now, in 2021, the virtual reality space will be a $215 billion industry, right? That's just in the next three years. There's so much effort and money and technology that's going into this. I think the wheel's moving. I think it's one of those things where the momentum is behind it. It is going to happen. It's just a matter of how quickly and to what degree it's going to impact, but I think it's going to spread across all industries faster than we can imagine. Joey: No, no, no. 200. 215. 215 billion. Joey: 215 billion. That's serious coin. That's serious money to throw in the next three years. Dan: Yeah, but I mean, let's just put that and let's compare that, right? Google has a market cap as of this recording of over $700 billion. Apple is over $862 billion. Amazon is almost 700 billion, but these are just single companies. Joey: Right. Right, but this is the wrong math. Yeah, but you're comparing that math to their market cap. That's the wrong math to compare to. You need to compare the revenues. That's what they're saying is that over the next three years, as much money is going to be spent on virtual reality as is spent in Walmart over the course of six months globally. Stop and think about that. Imagine a business the size of half the size of Walmart that no one is paying attention to right now, and growing that fast. I mean, Walmart created that size over decades. This is what's going to happen in the next three years. I'm telling you, we're on the edge of this thing. It's going to be big. Dan: All right. There are lots of barriers to entry here for the consumer, and this is one of the things that bothers me about it. You have to be pretty technologically savvy. I mean, yeah, anybody can put on some goggles, but even just listening to the words and the descriptions of the items that the main character in the book 'Ready Player One' uses, haptic suits, and I forget what the gloves are called, but something about using it so that your fingers can be used just like in real life, and these glasses, and you look like a fool with all this stuff on. I don't see people going out and spending hundreds, if not, thousands of dollars on this equipment just so they can go take a joyride in a DeLorean or go listen to some concert by some Marshmallow band. I just don't see that happening. Joey: This is the same type of thinking that would say, "I don't see someone spending a thousand dollars on a cellphone", and yet, that's what everyone who has an iPhone X is doing, right? I think ... Here's the thing. Number one, the cost is going to come down, and it's going to come down dramatically. Do me a favor, anybody listening and especially, Dan, since you're disagreeing, go on TED on TED.com and search for a talk by David Eagleman. E-A-G-L-E, Eagle like the bird, Eagleman, David Eagleman. I actually had dinner with this guy while I was at South by Southwest. He is one of the foremost researchers. He's a neuroscientist on haptics, right? This idea that you would create clothing or things that you wear that vibrate in a way to give you a physical or tactile experience to things that are happening on the internet. Watch his talk. I'm not even going to begin to explain it. This talk will blow your mind. This is the guy who's on the cutting edge, and between South by Southwest and when we're recording this episode, which has been just a few weeks, he announced this new haptic suit that they have. The price tag on this puppy is less than 400 bucks. Now, we're getting into where the average person who thinks nothing of dropping a couple hundred bucks on an Xbox or on a PlayStation or on some other gaming device to get them to spend another 400 bucks to actually physically experience their time in virtual reality is not a big ask. Joey: No, it's not taking off over the world yet, but look at what video and what gamification has done. There isn't a big business brand that isn't actively considering gamification as a way to build customer engagement, and that's exactly where it came from. It came from video games, and playing games to win points, and building that into a business setting. Dan: I get that, and I also get your reference to the iPhone X, but I think what you're missing is that the reason why people pay that money, first of all, almost all of them pay it on installment, but secondly, the reason why people pay that money is because the iPhone or whatever smartphone it is you use is probably the single most important piece of equipment that you use during the day, and you use it for almost everything. It never leaves your side. I don't think the people, including you that are saying that the haptic suit is going to become this next item that never leaves your side during the day. I just don't believe that. Like I can see people buying it and playing it like they play the Xbox or the Wii or something like that. I understand that. It's a fun diversion, but I'm not sure that I'm seeing this thing again taking over the world. Joey: I'm telling you, when employers recognize that the cost and the lost productivity they have for requiring their employees to come to an office and work from 9:00 to 5:00, including their commute time, when employers realize what a foolish decision this is, and that letting people work virtually from home is the solution, and we can create virtual worlds where they can have the conversation by the Watercooler, where they can walk into a room that simulates what it would be like to walk into a boardroom, and yet they don't have to physically travel to be there, I mean, we talked about earlier in the CXPRESS conversation that we had about the automakers, the designers at Peugeot, and at Ford, and at some of the other auto companies that are using this type of technology to be able to bring their designers together in the same room virtually to work on a car. I'm telling you, it's a matter of time. It's a matter of time. I predict that if you compare that spend that you mentioned, the $250 billion by 2021, I think this is going to basically be maybe a little bit bigger than some of the other video game systems that we've seen because they'll expand into different industries like health, but I don't think that this thing is the next internet by any stretch of imagination. Joey: I'm sorry, Dan. I'm sorry. Were you still talking? I was in virtual reality. Dan: Yeah. I'm sure you were. You're playing some sort of game while I was talking and recording a podcast. Joey: Yeah. No, no. It's totally fine. It's totally fine, Dan. Dan: You know what? Hey. Joey: Have fun. Have fun here in 2018. I'll see you in the future. Dan: Yeah. Yeah. You got to be kidding me. In the future, we're not even going to have to record a podcast. We'll just simulate. Joey: Let's just have everybody come to virtual reality. We're going to look forward to seeing all of you there. Dan: I guess we'll just need to agree to disagree. Joey: Agree to disagree. Listen in while we try to stomp and surprise each other with the fantastic statistic from the worlds of customer experience and customer service. It's time to check out this number. Okay, Dan, the number is 50%. What do you think it refers to? Dan: Oh boy, 50%. I'm going to go with the percentage chance that I get this answer right. Joey: Sadly, sadly, my friend, you fell in the 50% that was wrong, but I appreciate the enthusiasm. No. The 50% I'm referring to is the fact that 50% of consumers lead their transactional loyalty program accounts inactive. That's a fancy way of saying like all of these loyalty programs where you earn points or get discounts, et cetera, that businesses think consumers are going to behave with in a rational fashion. The fact of the matter is, 50% do nothing with these accounts and the points they accumulate, which leads to inactive accounts and hundreds of millions of dollars in discounts being lost and unclaimed. This comes from our friends at Oracle SmarterCX and their article '3 Ways Your Small Business Can Foster Loyalty With a Human-to-Human Customer Experience'. Dan: I think that's interesting and not particularly surprising. As our listeners know, I worked at a credit card business for almost a decade, and I started my career there in the rewards area, so I know a lot about rewards and loyalty programs. One of the things that they are built on is this idea called 'Breakage', and breakage is basically the rewards that go unclaimed. It's very well-known in the gift card space, and some states have even acted it with legislation to make sure that breakage does not happen and that customers don't lose the value of gift cards for example, but it's why a lot of loyalty programs exist. That said, it is counterintuitive because the whole idea of a loyalty program is to drive loyalty, and if you're gaining these points and never using them, it's really hard to do that. One thing that I would say is that we identified in the credit card world that redeeming your rewards was one of the single best experiences that you ever have with your credit card because it was fun. 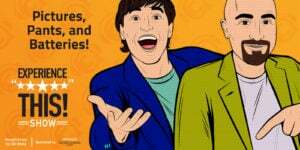 It's like getting free money, and so certainly as a consumer, I would say go check out those programs that you're in and definitely participate in them if you are leaving those points unclaimed. Joey: Use your points, people. Use your points. For the full article and to get more great content, check out SmarterCX.com/experiencethis. The folks at Oracle CX are big supporters of the Experience This! Show and sponsors of our show, which we greatly appreciate. Joey: Thanks, Oracle. Woo hoo, and go check out their website. It's really cool. What I love about this website is you will find dozens of articles that are not only interesting to read, but relevant to your work. There are a lot of different websites out there around the CX space, and the customer experience space. I highly encourage you to check out SmarterCX.com/experiencethis. They're the best of the best. It's worth going to see what they have to say. Thanks so much.